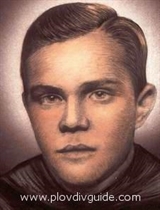 Father Pavel Dzhidzhov was born in Plovdiv on July 7th, 1919, in a catholic family. In 1926, he became a student at the primary school of the Assumptionists in Plovdiv - St. Andrews College. In the period 1931-1938 he studied at the Plovdiv College St. Augustine. In 1938 he became a novice in France and accepted the name of Pavel. He studied Philosophy and Theology outside Paris until 1942. As a catholic priest in Varna, he studied Economics and Social Studies, so that he would later take on the business activities and the housekeeping of the catholic mission. He took care of the housekeeping of the St Augustine College in Plovdiv. He was the second one in the list of catholic priests accused in a conspiracyagainst the security of the communist state (1952). He was shot on November 12th, 1952, in the city of Sofia, together with other catholic priests. During his visit to Plovdiv in May 2002, Pope John Paul II declared three Bulgarian martyr priests as beatific - Kamen Vitchev (born in 1893), Pavel Dzhidzhov (born in 1919) and Yosaphat Shishkov born in (1884), executed by the communists in 1952. The pontiff officially announced their beatifications - the last step before raising someone to sainthood - during his visit to Plovdiv in May 2002.